The fourth Volkswagen Golf Mk7.5 variant making its debut in Malaysia is the Volkswagen Golf R. The model was introduced alongside the Golf GTI and Golf 1.4 TSI Sportline/R-Line versions. The refresh brings about styling revisions – at the front, the facelift gets a new bumper, a revised lower grille intake design (a rectangular pattern replaces the previous horizontal slats) and new Advanced Adaptive LED headlamps with dynamic light assist. The rework also introduces LED tail lights and a revised four-slat diffuser at the rear as well as 19-inch Pretoria Black alloys – and 235/35 profile tyres – for the local specification car. The model’s 2.0 litre TSI engine has 290 PS at 5,500 to 6,500 rpm and 380 Nm from 2,000 to 5,400 rpm for output numbers – the 290 PS power rating (instead of the 310 PS seen in other markets) follows the path taken with the pre-facelift, in which the mill is detuned for our market. The unit is paired with a seven-speed, wet dual-clutch DSG transmission, and power is applied to all four wheels via the automaker’s 4Motion all-wheel drive system. Performance figures include a 0-100 km/h time of 5.1 seconds and an electronically-limited 250 km/h top speed. Inside, the car features Vienna R leather interior upholstery, an R sports steering wheel with paddle shifters, brushed stainless steel pedals and illuminated scuff plates. As standard, the Golf R facelift comes equipped with Adaptive Chassis Control (DCC), an Air Care dual-zone climatronic system, a configurable 12.3-inch Active Info Display virtual instrument cluster and power-adjustable driver’s seat with memory (the front passenger seat is a manual adjustment unit). It also features a 9.2-inch touchscreen Discover Pro infotainment system with a gesture control function. Aside from an eight-speaker audio system, there’s a 10 GB jukebox on top of the usual connectivity features, which includes App-Connect, which offers smartphone screen mirroring functionality via Apple CarPlay, Android Auto or MirrorLink. Other items include park distance control and a rear-view camera. Like the GTI, the R comes with front/rear fog lamps, driver profile selection, cruise control and automatic headlights/wipers and keyless access lock/start, among other things. Safety-wise, the car is equipped with seven airbags, ESC and a Proactive Occupant Protection System. Three colours are available for the Golf R, Lapiz Blue, Pure White and Deep Black. The facelifted Volkswagen Golf R is priced at RM295,990 (on-the-road without insurance), and is covered by a Volkswagen Passenger Cars Malaysia (VPCM) package that includes a five-year factory warranty with five years of free roadside assistance and three years/45,000 km free service. Check out the full specifications of the Volkswagen Golf R facelift at CarBase.my. Proton Golf RM77k only when VW takeover. All VW owners got tow truck contact on speedial. Why not bringing the 310ps Golf-R here? Fuel not Euro6 level. For Euro5 need to detune abit to meet local emissions standards. But theres alwiz racechip. I bought a 2010 BMW 740li for RM100k. Comes stock 326bhp engine. More powerful than this VW. I am palnning to re-map the ECU to give me 500bhp. My total cost RM120k. RM180k i save, i can use for service, buy additional warranty etc and future repairs. This is wet clutch DSG. Not as bad as dry clutch DSG but still kaki breakdown. As with all VWs in Malaysia, 2 years later this car will be in mudah for RM120k. Not bad….from RM296 to RM120k. You save RM180k plus you still have 3 years warranty intact. DSG is just a name. Its basically dual clutch gearbox. Every company from Honda to Hyundai; BMW to Brabham; Corolla to Chevrolet uses it. The only problem lies with the dry version in hot climate countries because its mechatronics does not use lubricant such as the wet ones. ALL dry clutch gearboxes from ALL manufacturers have the same problem. The only reason people talk about VW cars is because it is the the biggest user of dual clutch gearboxes. I have known cases of Honda, Chevrolet, Hyundai, Ford and BMW dry clutch gearboxes having the same problem. But you know what? There is nothing you can do, because in the near future, there wont be any conventional automatic transmission cars anymore. All cars will eithet be dual clutch ot CVT. So get used to it. Price starts from USD39k. But if you add in power seats, leather, etc etc, it vomes up quite a bit.maybe another Several k.
But real ugly car. Mostly uncle driving this overpriced junk. Nothing special, just rubbish performance car. Cheaper than CTR but a much more capable track machine, plus Sausageland mari. Kudos to VPCM! What car is CTR….oh wai! How about RM320k Honda CTR then? Go get the biasa golf. Aiming for Golf R then complaint high price.. pfff.. Reminds me of a kid yesterday at Toys R Us whining and crying loudly when his parents refuse to buy him that toy. Whine & cry, whine & cry. Lolz! I bow to ur pwnage of him. stop talking crap, go ahead and buy. pre reg mercedes A45 AMG. Or maybe you only can afford to get yourself a besi buruk with A45 AMG emblem on. 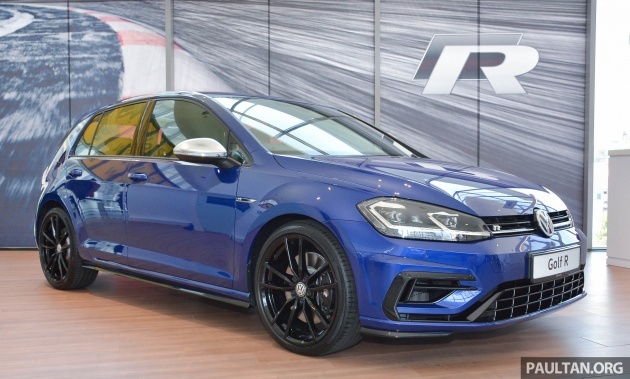 I think this VW Golf R commands more “status” than an A45 AMG because it kinda shows you know what you’re buying and what you want. But de-tuning this and having slower 0-100 times doesn’t help though. VW arteon R @ 320hp. Nobody except car nerds know its golf R. Most people just pity owner of this car because too poor to miss out on Merc or BMW. Ais Kacang. You are obviously a Malaysian who has never lived outside of this country. Lets not talk UK or Europe. Even in Thailand, Indonesia, Philippines and Singapore, the best selling performance hatch is the Volkswagen Golf R and GTIs. Not Merc A Class or BMW 1 series. Because people who drive performance cars know what this car is. Its a pure performance machine. A45 AMG a really uncomfortable car. Very cramp behind too. What a joke…So many much better reliable option for the money! Skip! For those who complain and complain everyday about not able to afford the overpriced AMG A45 or FK8 type R, buy this Golf R straightaway. Golf R – poor man’s performance junk. i better buy a civic type R. better reliability and higher output. The unit is paired With a seven-speed, dual-clutch DSG transmission……..
Anthony, is it difficult to include the word – Wet or Dry Dual-Clutch DSG ?? Good to know. Wet or dry, it will die in the hands of Malaysian speed kakis. Good luck with the sales folks! Who buy a Golf “R”? Chances are a successful young man who don’t want to “show-off” but want a Solid German engineered built car that have enuff Power to keep up with some performance cars. Better buy a used GTR and run circles around this thing. No need old recon GTR bro, nowadays people buy FK8 Type R. It beats the Golf R in terms of engine output and looks more wild on the streets of Malaysia. Have more money or come from Rich family, AMG A45 FTW. Nuff said. Go ahead and buy your used GTR then. You won’t be whining here if you could afford the used GTR. gonna sell my Honda Type R for this Golf R…….Once I go conti, I wont go jepunis or kimchi no more……Class! Aiyo bro, Malaysians typically look at Honda’s good RV and will drive, love the H brand to death no matter how expensive they are. Hondas even come with extremely poor build quality. Check their Facebook page. All kinds of problems. Why go from amoi magnet to an unker car? Stay with the Honda if you wanna get the chicks. price lower 20k than civic type r, but top speed also slower 20km/h than civic. ctr win ! A race is not just a quarter mile run. On a track, This R with AWD will easily eat CTR with puny FWD. Owned God GTi Mk VII before, a fabulous fast yet great car for daily use….VW Golf GTI AND Golf R is by far one of the best sporty car and the engine and wet clutch DSG are not as problematic as those dry cloth gearbox…..you need to drive it to really appreciate this car especially in corners and wet road…superb car!!! Nowadays people buy FK8 Type R. It beats the Golf R in terms of engine output and looks more wild on the streets of Malaysia. Expecting poor customer and poor ownership experiences with frequent breakdown and car in workshop for weeks with always spare part shortage. If u r not lucky, car out from workshop can breakdown on the same day. No more VW 4 me! No golf alltrack station wagon? These cars are built too low for our riad bumps booby trapped roads.